Metal Gear Solid: VR Missions may be on its way to PS3, Vita and PSP. Originally released in North America in 1999, Metal Gear Solid: VR Missions was, for some, and arguably perfect package: the stealth fun of Metal Gear minus the hours of story content. Comprised primarily of a variety of short, increasingly difficult missions, it was a fun bit of extra content that fans of the Metal Gear Solid experience could enjoy. Now, it appears that franchise fans will be given another chance to take VR Missions for a spin. 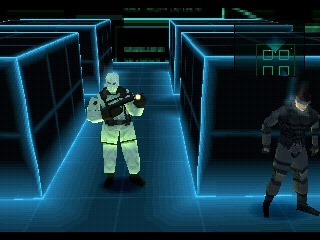 The game, which recently appeared as a digital download in Metal Gear Solid: The Legacy Collection, has been rated by the ESRB for the PlayStation 3, Vita, and PSP. While this on its own isn't quite a confirmation, its rating (Mature for Animated Blood and Violence) definitely suggests that a re-release is on the horizon separate from the Legacy Collection which hit store shelves earlier this month. The obvious destination for a new digital version would be the PSOne Classics section of the PlayStation Store. While its visuals and controls have most certainly aged since its original release, I'm going to go out on a limb and say that I'm excited to play VR Missions again. One of my biggest problems with some of the Metal Gear Solid games was their lack of content outside of the main story. In turn, one of the reasons I loved the Substance edition of Metal Gear Solid 2 and adored Peace Walker was the simple inclusion of extra stuff to do. VR Missions falls firmly into that "extras" category and, even if it's formed some rough edges over the years, I can picture it being a lot of fun on Vita.